Posted on February 10, 2017 by Matthew Leib. This entry was posted in Faculty Friday, Spotlight and tagged Faculty Friday. Bookmark the permalink. 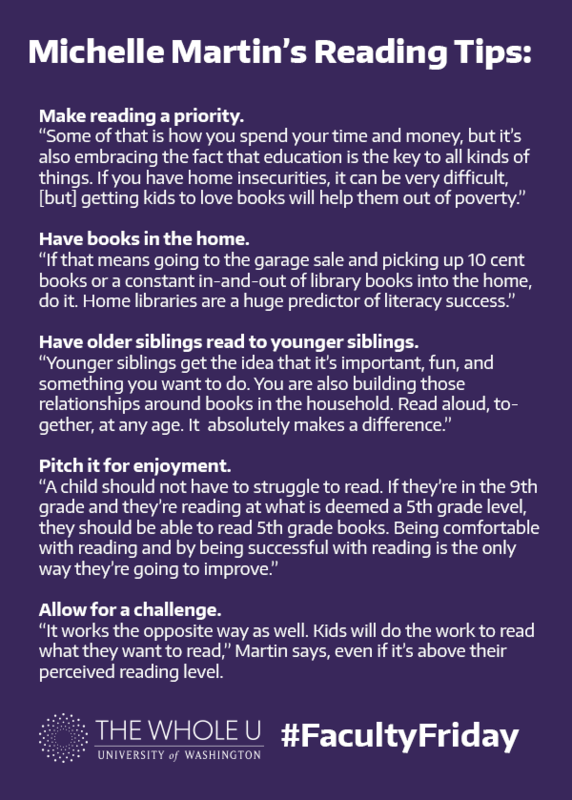 For Michelle Martin, the Beverly Cleary Professor for Children and Youth Services at the University of Washington’s Information School, reading’s best lessons aren’t found in the book, but in the binding. That live-out-loud quality defined Martin’s life long before she made a name for herself as an author, critic, community activist, and champion of diversity in children’s literature. Growing up in what she describes as a “middle-middle class African American neighborhood” in Columbia, South Carolina, Martin recalls classroom activities such as memorizing poetry and contests of rhetoric as having had a greater impression on her than reading any particular book in class. At home, Martin’s family placed a high value on literacy. Her grandmother was a kindergarten teacher and only a few credits from finishing her Ph.D. when she was diagnosed with Alzheimer’s. Even with her family’s academic pedigree, Martin’s focus from a young age was elsewhere—and that usually meant the outdoors. Instead she was out earning a Gold Award as a Girl Scout in high school and, after majoring in English as an undergrad at William and Mary, embarked on a five-year career as an outdoor educator, during which time she served as a naturalist at Sesquicentennial State Park in South Carolina’s Sandhills region. Based on that experience, Martin decided to embark on an independent study to produce a curriculum guide for teachers called Branching Out aimed at integrating books with outdoor themes into what students were learning in literature and history. The project would prove the kernel for Read-a-Rama, a program Martin founded in 2001 to help underserved students ages four to 11 connect with reading in ways they might never have thought possible by placing books at the center of a host of activities organized around a certain theme. After running it for eight years as a semester program, Martin organized the first multi-day summer camp in 2009 around a theme of water and heat, dubbing it, Columbia Summer Sizzle. “We took them swimming, we taught them about the scientific properties of water, we brought in a watercolorist to teach about how to paint with watercolors, we took them to see glassblowing so they could see how heat works,” she says of the program’s first full summer slate of activities, another hallmark of which is that all participants receive a free book. A recent study by the Packer and MacArthur Foundation found that the average middle class child logs 1000-1700 hours of one-on-one picture book reading against the low-income child’s 25 hours—nothing short of an egregious gulf in access and opportunity. For Martin, her work is about reducing the distance between books and life as children live it. Camp Read-a-Rama ran for five years at Clemson and for two at the University of South Carolina in Columbia, overlapping two summers. This coming summer in Seattle, Martin plans to run reading camps for two-and-a-half weeks—one for about 35 children at an affordable housing complex for formerly homeless families and another for young adults at the Gethsemane Lutheran Church downtown. Martin’s outreach specifically targets areas with high populations of low-income students who are especially susceptible to “summer slide,” the three month period where many tend to lose ground academically. She says her hope is that Read-a-Rama one day serves as a national model for literacy engagement camps for children. Children’s literature, for all its whimsy and innocence, still bears countenance to issues of marginalization and race at work in society today. Many traditions of minority literature find their origins in stories written for the entertainment of a white readership before “champions from within” were able to reclaim it as their own. For Martin, this literary history of appropriation and ignorance limits minority populations from the imagination and growth that comes from being able to see oneself reflected in the world. “We need diverse books in which children can find reflections of themselves,” Martin says, referencing renowned author and children’s literature scholar Rudine Sims Bishop’s seminal “Mirrors, Windows, and Doors” thesis, which holds that children’s literature should be a mirror in which children can to see themselves reflected, a window through which they can see other worlds, and a sliding glass door so as to allow readers to enter such worlds. Martin is at work on a book about the two “fathers of African American children’s literature,” Langston Hughes and Arna Bontemps, who, as part of Harlem Renaissance in the 1920s, created a large body of work for children celebrating African American life, much of which remains unpublished to this day. Resurfacing such texts is essential not only because they are seminal classics, but also because they provide a new context for how African American life is typically portrayed in what books do exist. To bridge the gulf created when publishing’s gatekeepers refuse to break the exclusionary molds and models they’ve established and to which they, by and large, unswervingly adhere, Martin says many authors and illustrators are creating their own presses and books to get their work into the world. This summer, Martin plans to stretch far indeed—leading a study abroad program to Great Britain, titled “Wizards, Whangdoodles, and Whizzpoppers” after elements found in the work of famed British children’s authors J.K. Rowling and Roald Dahl. And that will just be her first year here. While Martin’s major goal is to diversify people’s thinking about the histories of children’s and young adult literature, she recognizes her own limitations. 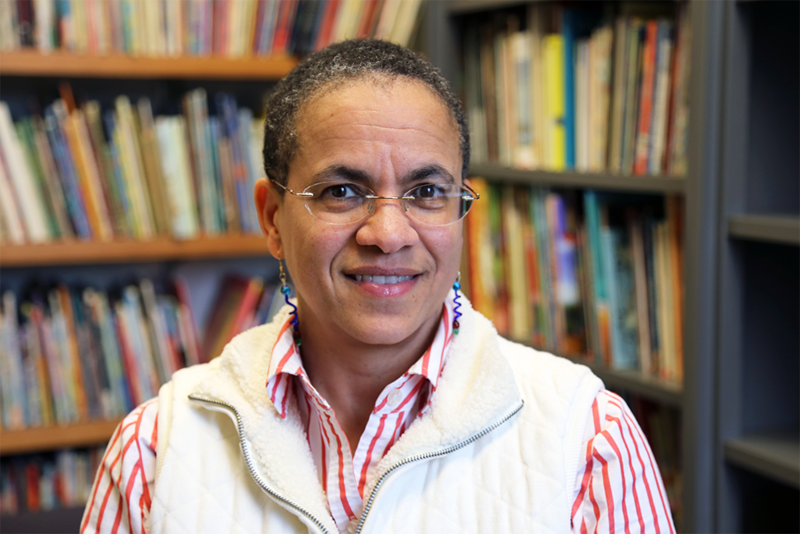 She says that while her own cultural competence is strong for African American literature, she will work to bring experts to campus whose insight into other children’s literary traditions better and more broadly reflect the cultural milieu. It’s the cross-generational impact of her work Martin finds most invigorating— whether that’s on a scholarly level, at a student camp, or in her own home. At night, she and her husband still make a habit of reading together with their 13-year-old daughter. Reading with mom has recently entailed cracking the spine of Harry Potter and the Chamber of Secrets, while reading with dad tackles The Grapes of Wrath. For Martin, the difference is clear. Michelle Martin has a B.A. in English literature from the College of William and Mary, a Master’s in Outdoor Teacher Education from Northern Illinois University, and a Ph.D. in English from Illinois State University. Learn more about Read-a-Rama here.